My daughter and I love the Dear Canada series. Not only do we learn a part of Canadian history but the story is told in diary format and from the point of view of a pre-teen protagonist. The historical event chosen is appealing to the middle-grade reader because it comes alive through the personal eyes of a girl. All of this holds true for the latest book in the series, That Fatal Night in which 12 year-old Dorothy Wilton, a Titanic survivor, is suspended from school after she whops a girl at school for saying something disparaging about the Titanic disaster. It was hard not to like Dorothy from the very beginning! This was a spunky girl and we were quickly absorbed in her story. My daughter loved her instantly. 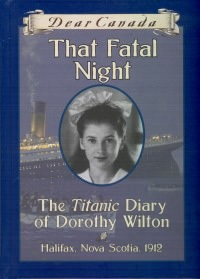 Dorothy's kind teacher asked her to write about her experience on the ship but Dorothy is reluctant, so initially she writes about everything else with only hints of her journey on the Titanic. She tells of staying with her grandparents in England and the fun things they did. The bits she inserts about the Titanic stir our curiosity since we wonder how she survived, what is the secret she' s withholding about that night, and how she finally got home. My daughter really liked this take on a Titanic story. She didn't want a sad story, like some of the other Titanic books we've read. Writing from the point of view of a girl who suffered survivor's guilt was a refreshing perspective. It was about how a young girl dealt with an emotional trauma after the fact, after she returned home to Halifax. We liked the ending, especially the epilogue. The historical note and photographs at the end just cemented the fact that some of the people mentioned by Dorothy actually lived in 1912 and were a real part of the Titanic disaster. I also enjoyed the Author's Note about some of the stories she encountered while doing research. It reminded me of the Titanic exhibit my husband and I had seen in Las Vegas two years ago. We highly recommend this book and all the Dear Canada series. They are well-written and appealing to middle-grade girls. If you live in Vancouver, then check out this event happening today! to celebrate their new books about the night the Great Ship Went Down. Come for songs, readings and learn more about this fascinating topic! This is a free event, so please help spread the word to any of your Vancouver-dwelling followers! Both books will be available for purchase. 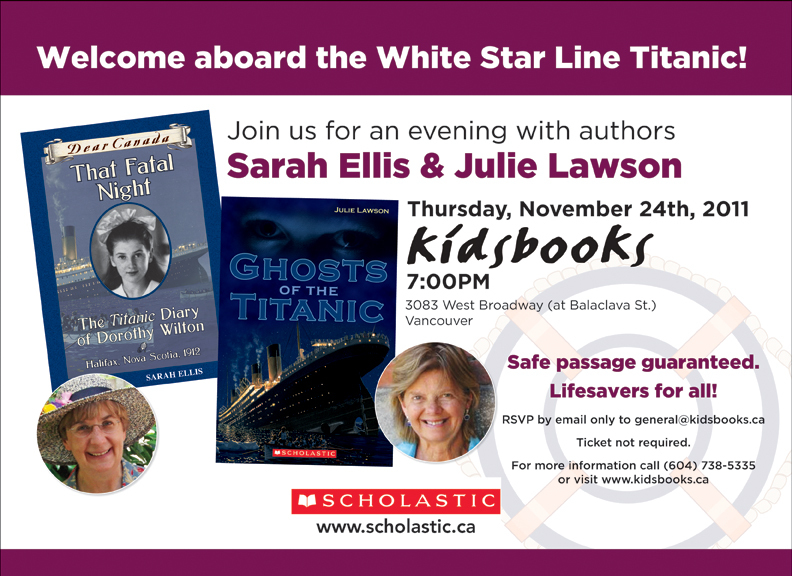 Scholastic announced plans to commemorate the landmark occasion with a relaunch of the www.dearcanada.ca website, a bonus book giveaway promotion and the release of the 29th Dear Canada book, That Fatal Night. Since its launch in 2001, the Dear Canada series has been embraced and celebrated by readers, teachers and parents alike, receiving high praise for its effective combination of engaging storytelling and historical accuracy. Each title is written in an accessible diary format by fictional girls living in tumultuous times in Canadian history. To date, 29 Dear Canada titles have been published, with settings ranging from the War of 1812 to the Halifax explosion of 1917; from the Riel resistance of 1883 to the polio epidemic of the 1930s. A Prairie as Wide as the Sea by Sarah Ellis was published in fall 2001. To help celebrate the 10th anniversary, Scholastic Canada is giving away this book as a free bonus with the purchase of Ellis’s Dear Canada: That Fatal Night. This sounds like a wonderful book! I think Titanic books are going to be hot next year.